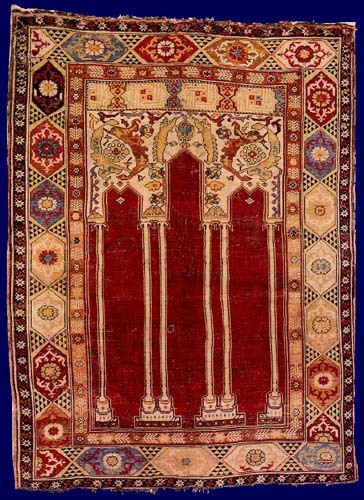 In Transylvania and the museums in Budapest there are at least 17 six- or four-column rugs that have hexagonal cartouche borders and spandrel designs composed of large paired leaves. On one example the spandrels have a red background, the others all use ivory, as here. Ten have no extra panel above the spandrels, five have various floral designs in the panel and two have cartouches filled with highly stylised Kufic script, as seen here. Variations appear within the hexagonal cartouche in the border: most, including the Rath rug, have a central rosette with a cloudband either side, while others have a central diamond from which small flowers extend. There are many rugs with similar weave, colours and handle: some have similar field designs but different borders; others have three, four or five columns and different spandrel designs but generally feature the hexagonal cartouche border. All these rugs probably originate from the same small area, if not the same village.